18/10/2013 According to American sports data statistics, people are increasing moving away from traditional sports. While some people are retreating to the safety of the couch or indulging in the virtual world of video games, an increasing number of people are gravitating towards adventure and extreme sports. Popular activities such as skateboarding and surfing are at one end of the spectrum, with life-threatening pursuits like BASE jumping and free solo climbing at the other. Most new extreme sports are variations on existing activities, many of which are already considered extreme in their vanilla state. For example, surfers use a jet ski or helicopter to help them catch bigger waves, rock climbers decide to throw away their safety gear, and sky divers turn into BASE jumpers by launching from buildings instead of planes. There are also brand new sports emerging, however, with the development of new equipment leading to activities like powerbocking and wingsuit flying. Powerbocking is a form of technologically enhanced free running, with participants using elastic-like spring-loaded stilts to perform jumps and tricks. While it is debatable whether this is a sport or form of self expression, powerbocking is definitely unique. Wingsuit flying is another new activity getting lots of attention, and perhaps the closest example yet of unassisted human flight. 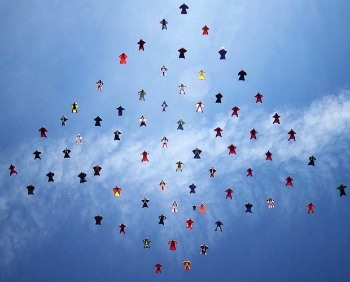 While participants wear a parachute designed for BASE jumping, they also wear a special wingsuit that provides enough lift to enable flight, at least for a little while. While technology has been the catalyst for a number of new adventure activities, perhaps the most extreme sport of all, free solo climbing, uses no equipment whatsoever. As if rock climbing wasn't dangerous enough, free solo climbers ascend steep slopes alone with no safety ropes. While it is easy to label these activities crazy and their participants insane, according to researchers, engagement in extreme sports is more about confronting mortality and self transformation than it is about cheating death. In one study at QUT University in Brisbane, Dr Eric Brymer and Associate Professor Robert Schweitzera discovered a number of themes when interviewing extreme sports enthusiasts. Interviewees spoke of fear as a "healthy emotion" and experienced self transformation through managing and pushing past fear. In one interview, a A BASE jumper described the pursuit as "the ultimate metaphor for jumping into life rather than standing on the edge quivering". According to Brymer in a recent interview with the ABC, the over commercialisation of traditional sports and everyday insulation from the risks of nature are two of the driving forces behind the growth in extreme sports. While most people are more than happy with the comforts and safety of modern life, it seems there will always be people out there who need to push the boundaries of the human experience.